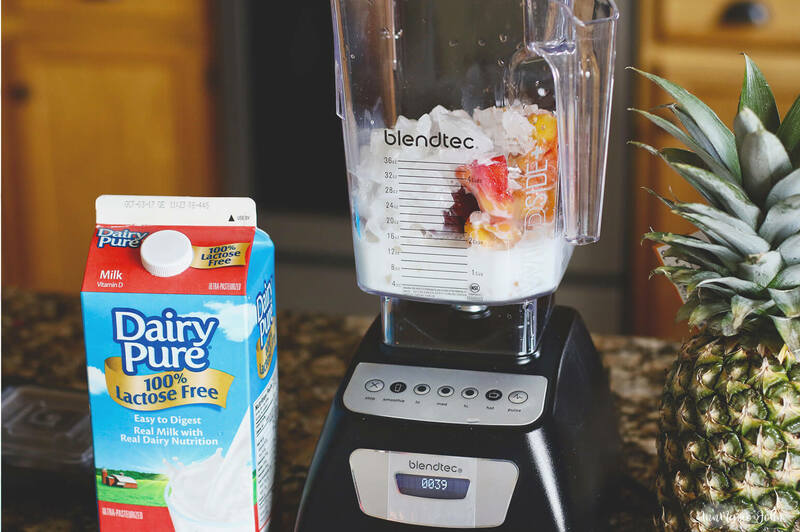 Get your morning off to a good start by enjoying this tropical breakfast smoothie, made with DairyPure Lactose Free Milk. Breakfast, the most important meal of the day, however, breakfast can occasionally be the one meal that we skip. I've been trying to do better when it comes to having breakfast. While I would make sure that the kids are fed, between getting them ready and out the door, it leaves little to no time for myself. As many of you know, my kids AND my husband all suffer from lactose allergy, while I personally do not. However, I hate heading to the supermarket to buy 2 different kinds of milk, so I would just drink whatever they drank. I am a big fan of whole milk, and please don't tell me that 2% is better for me. I don't like the taste and surprisingly, neither do my kids. So when I went into the supermarket recently and saw that DairyPure, a brand I already knew and loved had a whole milk that was lactose free, I knew I just had to give it a try. I relish products that not only taste great, but ARE good for you. When you have a family, their health is something that you anguish about, which is why I love shopping at natural grocers. Foods that are organic, contains no artificial growth hormones and is just better for me and my family is my number one priority. With DairyPure Lactose Free Milk I have no worries. It is the only milk backed by an exclusive Five-Point Purity Promise. It contains no artificial growth hormones, is tested for antibiotics, and is continually quality tested to ensure purity. If that wasn't enough to make you say yes to purchasing it for yourself and your family, listen to this:- It tastes just like milk without the lactose so is much easier for them to digest, and you can't even tell the difference. I recall my husband and kids saying that I was lying because it tasted just like real milk. But I digress! With mornings getting increasingly more difficult when it comes to having breakfast, I decided to make breakfast smoothies for the entire family, that not only tastes great but gives everyone the boost they need to jump start their morning. I named this my tropical breakfast smoothies since it contains mangoes and pineapples which are normally in the tropics. If you can't find mangoes where you live, you can substitute them for whatever fruits are in season. Tip: Freeze your fruits overnight. In a blender, combine your ingredients (mango, pineapple, strawberry, peaches, honey, and ice) and blend until smooth. Now you can enjoy Whole, Reduced Fat, Lowfat or Fat Free Lactose Free Milk just how you’d enjoy regular milk with DairyPure Lactose Free Milk! 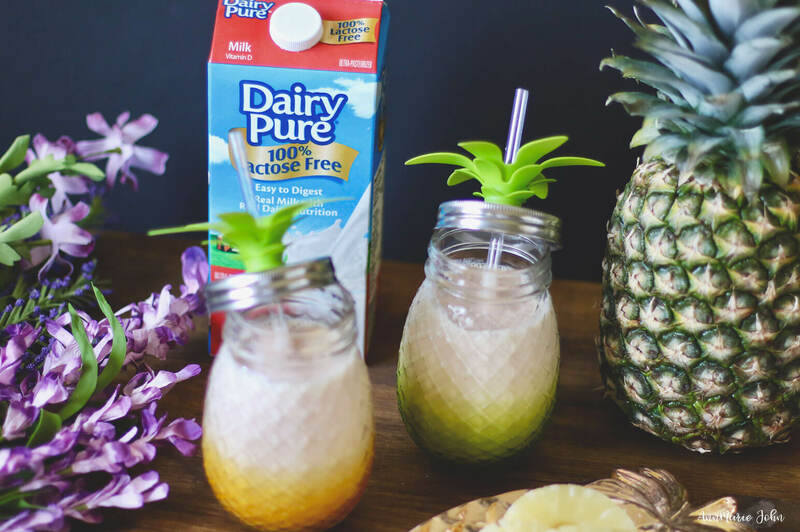 You can find DairyPure Lactose Free Milk in the dairy case at grocery stores nationwide. This looks delicious! Love smoothies and the glasses are super cute too! Great way to get your serving of fruit! Those smoothies sound and look delicious. I can't do milk in the morning, I need try Dairy Pure. I love your hair! This sounds like a yummy smoothie. I love drinking smoothies for breakfast! Yep, I am sensitive to lactose and it makes me so sad! But with products like this coming out, I don't have to give up my glass of milk with my cookies! There are so many mornings where I find myself skipping breakfast due to being short on time. This smoothie would make a fast and easy option that I could easily take along on the go! Oh my gosh those cups are so cute! I love all things pineapples! This smoothie sounds absolutely delicious and I cannot wait to give it a try! Yum! I love the tropical fruits in this smoothie. What a tasty way to start the day! I don't tolerate daily at all, so I switched to almond milk. I would like to give Dairy Pure a try to see how my body reacts. Your smoothie sounds so good! These smoothies look delicious! They're a great way to have a quick, yet nutritious and filling breakfast. OMG, I love your glasses! SO adorable! I think these smoothies are perfect for the fam, I love that the milk that you used is lactose free. 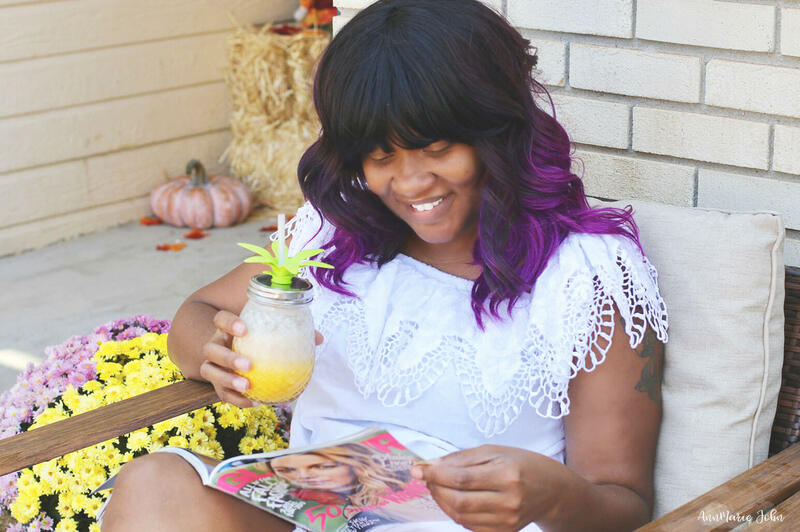 Smoothies are usually my go-to when mornings are busy and I'd love to try a recipe that reminds me of the summer. This looks so yummy! I love the pineapple jars you put it in! So cute. I absolutely love smoothies and they're perfect for starting your morning! I'm not at all lactose intolerant but it's nice to know that there's a milk that's lactose free. Perfect for people who would like to enjoy milk without the consequences. Wow, those smoothies (and those glasses) are spot on. I agree with you about whole milk. Surprisingly I didn't think about it much until I had kids who had it. Then I realized the taste was unmatched. That looks so refreshing! Would love to try it this weekend! This smoothie looks and sounds delicious! I have been making smoothies every morning for breakfast on my way to work and I will definitely need to add this recipe to my rotation! That milk sounds great! Whilst I'm not lactose intollerant, I often get bloated after milk so am always on the look out for new options to try. These smoothies look lovely, and those glasses are so cool! We love this brand and have used it many times. That smoothies sounds delicious! I don't think I've ever heard of this brand. Lactose free milk would be a great option for us to try since I'm pretty sure I have one little one that has an intolerance. Is it wrong that I want to add a little tequila or rum to mine? I adore smoothies and try to have one at least several times a week. They really help get the day started. I like to have my smoothie while I'm getting ready for work. 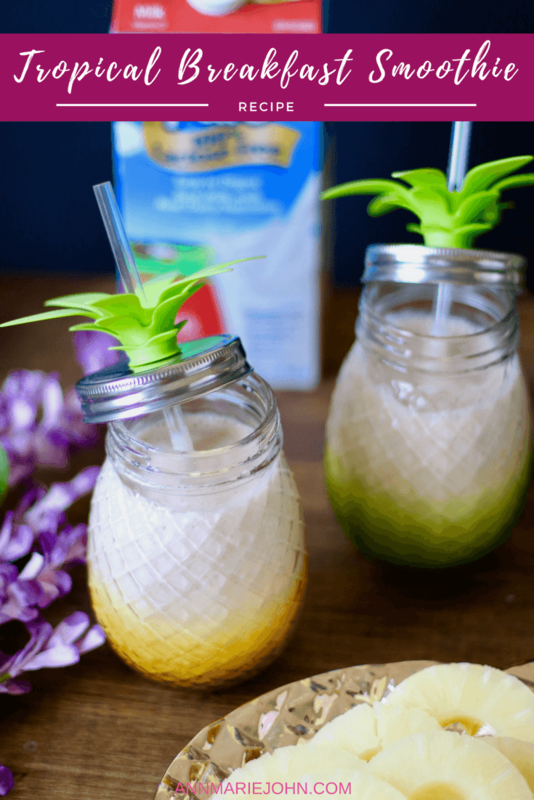 Having one with tropical flavors sounds like a fun way to imagine you are enjoying a beach vacation instead of heading out for the daily commute. I'm not a fan of mango but my kids are. The rest sounds so good so maybe one batch with mango and one without. My husband is showing signs of lactose intolerance. I guess it comes with age? He wasn't that way before. Anyway, I will have to try Dairy Pure. No more of that two different kinds of milk in the house. My husband and child loves pineapple and mango. This would be a huge hit in our house, especially because of the lactose free milk! We will be making this this week for sure. 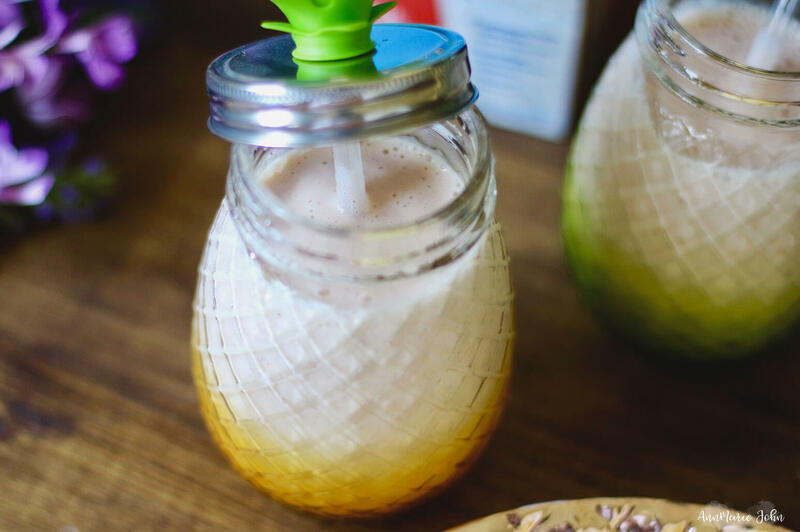 This looks delicious and I love your pineapple cups! My kids did a fruit challenge at school to write descriptions about food. It reminded my oldest how much she likes mango. She's going to love this recipe! Lactose is something that a lot of people have trouble with. I love that there is a brand out there that has a whole milk that is lactose free! Oh I need to check out this type of milk. I struggle with finding something that will work with my dairy issues. This smoothie sounds delicious too!